We have had the joy of receiving two new missionaries into our Priory! 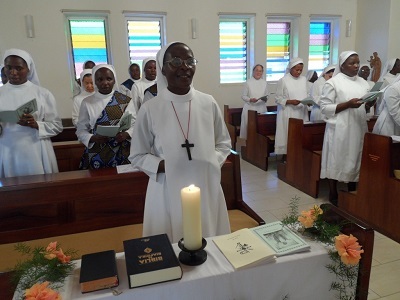 Sr. Maria Bernadette Kithuka arrived on the Feast of St. Maur and St. Placid from the Nairobi Priory. Sr. Maria will be assisting in teaching formation. She will be with us for two years. Sr. Edilania Leite de Figueiredo comes to us from the Sorocaba Priory. She arrived this year on January 25th. Her assignment will be in the priory sewing department helping with sewing new clothing for the sisters and other projects. She is currently working on strengthening her English and learning Kiswahili. As we are committed to give as well as receive, we have the joy of sending our Sr. Raphaela to Namibia. The rite of mission occured on February 22nd, the Feast of the chair of St. Peter. The chapel was filled with drumming, dancing and joyful song as we missioned our Sr. Raphaela Mlwilo to bring the Good News to Namibia! Sister has been asking for a long time for the opportunity to go for mission outside her home country of Tanzania. On this day, her dream came true. The rite took place after Communion and opened when Mother Rosann presented Sr. Raphaela a candle representing the light of Christ. Sr. Raphaela renewed her baptismal commitment and her religious vows. The whole community joined in the blessing and her priest-brother extended the solemn blessing of the Church. She will depart on March 7th for Namibia. For all our missionaries coming and going, we wish God’s choicest blessings.